SDH/SONET Monitor 3.0 has a daisy-chain feature which lets you retransmit the incoming signal. This is useful in two situations. The first is scaling layer-2 decoding capacity by adding more decoding hardware. The second is monitoring without an optical tap---'intrusive' monitoring. one submodule of an SDH/SONET Monitor 3.0 can decode all of that. The solution is to re-transmit the incoming signal to another submodule. That's what the blue lines in the diagram show. We added a short fiber going from one sub-module to another. That lets us process 320 of the 500 channels on one submodule and 180 on the other. The idea is to feed each direction of a link into a separate submodule, and then copy both directions to a chain of submodules using short fiber cables. In this example, I've shown a chain of three subsubmodules. Symmetric daisy-chaining lets every sub-module in the chain see all input. You can freely choose which sub-module in a chain processes which signalling channels---e.g. you might want to process the two directions of one signalling link on the same submodule. The upside of symmetric daisy-chaining is that it's conceptually cleaner: every submodule in a chain sees all of the input. The downside: symmetric daisy-chaining requires more fibers and in some situations also more hardware. 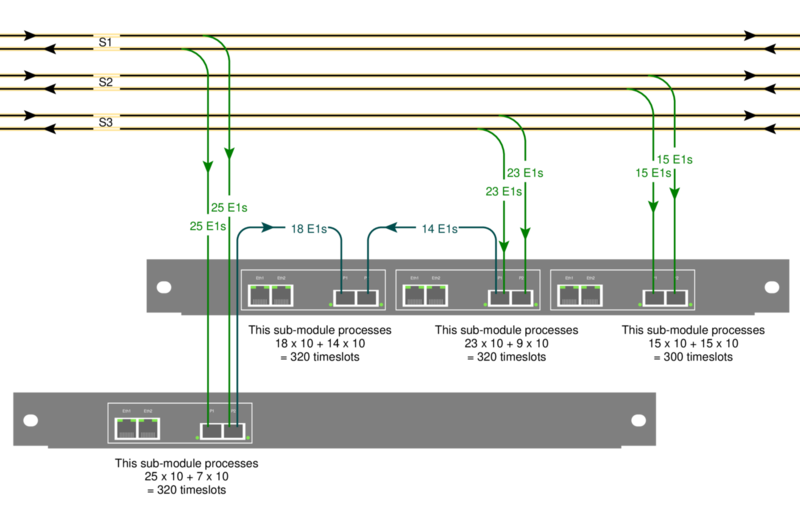 Normally, Corelatus hardware connects to optical networks via an optical tap. That way, you can be confident that the monitoring equipment won't disturb the live link. With daisy-chaining, you also have the option of routing a live signal through the SDH/SONET monitor 3.0, i.e. you don't need an optical splitter. That's particularly useful in situations where briefly interrupting a link is acceptable, e.g. during a site survey or while debugging. N.B. : daisy-chaining stops working when the power is off! That's why we use optical splitters for permanent installations.